Todd Spencer, executive vice president of the Owner-Operator Independent Drivers Association, in a letter to U.S. Trade Representative Robert Lighthizer on Sept. 28, said the original NAFTA trucking provision harms American truckers and jeopardizes highway safety. In a new agreement, Spencer said that OOIDA and the Teamsters union want longhaul trucking to be classified as an exempt service, effectively limiting Mexican carriers to operating within border zones. American Trucking Associations Chief Economist Bob Costello responded with a letter in which he urged Lighthizer to support the Mexican truck program and decried what he said was “fearmongering” about Mexican trucks driving beyond the commercial border zones. The largest Mexican-domiciled carrier in the program, representing more than half of the drivers permitted to drive beyond the border zone, is owned by an American trucking company, he pointed out. NAFTA’s trucking provisions reduce congestion at the border, Costello argued, by reducing the number of trucks making one-way trips. The latest data on NAFTA trade show a continuing surge in the value of goods moving among the United States, Canada and Mexico. In July, the value of NAFTA freight totaled $89.2 billion, a 6.2% rise from the same month a year ago and the ninth consecutive monthly increase, the U.S. Department of Transportation Bureau of Transportation Statistics reported Oct. 4. The value of goods moving by truck grew 4%, while rail shipments increased 4.4% and shipment by vessels and pipeline surged 24% and 23.1%, respectively, due in part to an increase in the volume of fuel imports. Teamsters President James Hoffa said the top issues in a new trade deal for union members in the United States and Canada is to strengthen workers’ rights to organize, improve highway safety and preserve market access rules for Canadian dairy products. In addition, the Teamsters wants to eliminate a dispute settlement mechanism in NAFTA that allows corporations to sue governments. 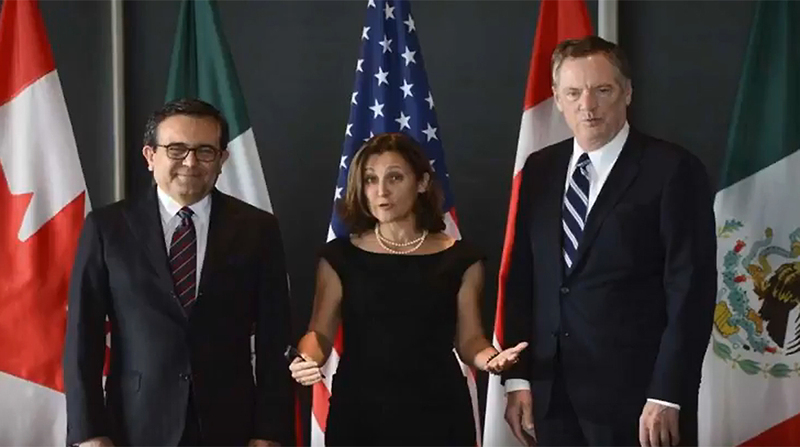 In a joint statement issued after the conclusion of the third round of NAFTA negotiations in Ottawa from Sept. 23-27, Canadian Foreign Affairs Minister Chrystia Freeland, Mexican Secretary of the Economy Ildefonso Guajardo and Lighthizer said progress was made in the areas of telecommunications, competition policy, digital trade, regulatory practices, and customs and trade facilitation. The parties also exchanged initial offers in the area of market access for government procurement. Discussions were substantively completed in the area of small- and medium-size enterprises, and representatives said they expect to conclude negotiations on the competition chapter before the next round of talks. The next round of talks is scheduled for Oct. 11-15.